Tools, they are our life blood; they are the things that we bond with in the workshop. We all have our favourites, indeed I know many who give certain gouges a name! We have a relationship with them, but we are always open to expanding our range. Into this exciting environment Robert Sorby have introduced the TurnMaster, a scraper tool with a difference. 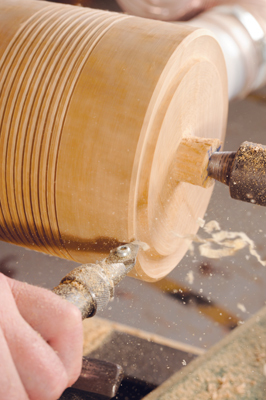 Able to remove and shape wood quickly, then with a simple adjustment of the head, lock the cutter into the perfect shear scraping angle to ensure a smooth finished surface ready for sanding. 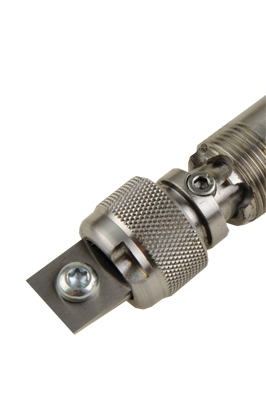 Not only that, the tool has the option of a range of cutter heads, in many different shapes and, interestingly, materials, each designed for a different purpose. On paper it looks like a one-stop-shop, a tool that does it all, but how true is this? I have had these tools in my workshop for some time now and have been able to test them out on a number of different woods and on both end and long grain. It has been an interesting journey for me, one in which I have ended up somewhat surprised at my conclusion. I received both the handled and unhandled versions and a Robert Sorby Sovereign 300mm handle. I also received a set of HSS cutters and a round titanium nitride cutter. There are seven different profiles but in this test I used the round, square and diamond shaped cutters. This selection provides a good starter range. The choice of HSS, titanium nitride and tungsten carbide is a matter of preference. These different materials have varying degrees of hardness and therefore wear resistance. All can be touched up using a diamond hone; however, it is recommended that the carbide tips be replaced once dull. to both left and right. 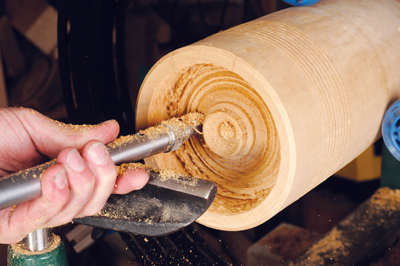 This allows the tool to be used both on bowls and spindle work, to remove and shape wood and then to shear the surface smooth. The unhandled tool fitted into the Sovereign handle with little difficulty, held in place by two grub screws. Once tightened, it was as solid as the fixed tool but better balanced due to the weight in the handle. After mounting a piece between centres, I noticed that due to the design of the tool - the flat section being 60mm from the end of the tip of the tool - the toolrest had to be moved back away so it sits properly. This appears to create a large overhang, something we are all taught to avoid in turning; however, due to the weight and stability of the TurnMaster it has no adverse effect. I positioned the toolrest above centre and allowed the tip to enter the wood at a slight downward angle. This eliminates the possibility of a catch. 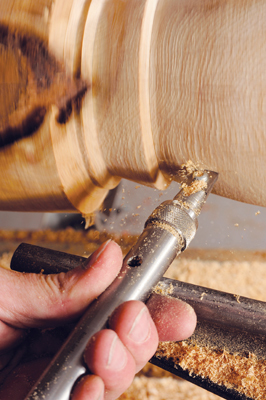 Depending on the pressure used, cutting the wood is fast and aggressive or delicate. I used the HSS square cutter with some pressure which converted my square spindle to round very quickly indeed. The consequence of this speed, however, is in the finish. The surface of the elm (Ulmus procera) I used was left very rough but the TurnMaster has a trick up its sleeve! By releasing the collar and positioning the cutter head into one of its shear cutting angles, the robust wood remover turns into a shear scraper which quickly creates a smooth surface. Moving onto some faceplate work, I mounted a piece of beech (Fagus sylvatica) and shaped the outside profile. The finish was very rough on the end grain. I switched to shear scraping mode and was able to clean up this surface. Changing the head cutter to the diamond shaped cutter it was easy to create fine detail, again to a good standard of finish. Using the round TiN cutter in the flat position I proceeded to hollow out the bowl with a round cutter. This was rapid and rough; however, using the tool's shear cutting setting, I was able to produce a good internal finish ready for sanding. to some extent, converted. The range and variety of cutters both in shape and material really does a good job of covering most situations. The weight and stability offers good reach over the toolrest and, with a longer handle than 300mm - a good match for this tool which will maximise its potential - deeper vessels would be well within its ability. 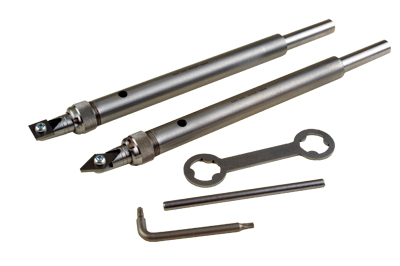 This tool provides a bridge between the more standard push and poke scrapers and the dedicated shear scraping tools, as well as the use of standard woodturning tools. For those struggling to master conventional tools or anyone suffering with arthritis or a carpal tunnel syndrome, this tool with its wide variety of cutters provides an attractive user friendly system to continue working. 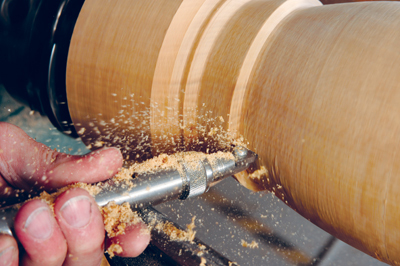 To the novice turner, they are easily mastered and will produce a surface finish ready for sanding. I would suggest that they seem to work best with green and air dried, close grained wood. Kiln-dried wood was much trickier to achieve a finish suitable for sanding on. For the more experienced turner, it is another useful addition to the toolbox. When I looked at this tool I too thought it was well constructed. After studying it, it is a hydrid of some of their other tools - the tipped hollowing tools/scrapers and the dedicated shear scrapers. The tips range is extensive and more tip designs are planned for the future. The tool does need to be used with the toolrest some way from the work. The nice thick shaft can take an extended overhang in work with minimal vibration. If you use it in such a mode then a longer handle is advised. These tools can be used as conventional scrapers, shaping tools or, because of the indexable head, as delicate shear cutting tools. This type of tool is gaining a lot of converts. Someone once said to me, "As long as a safe route is taken to create something, the tools used to get there are nothing more than a means to an end." This is an interesting development from Robert Sorby; they certainly do what they say they can and are likely to replace some of their existing range of tools. Robert Sorby have created a YouTube video clip which can be viewed here.